Calla Lily Combination in Sapphire and Purple. 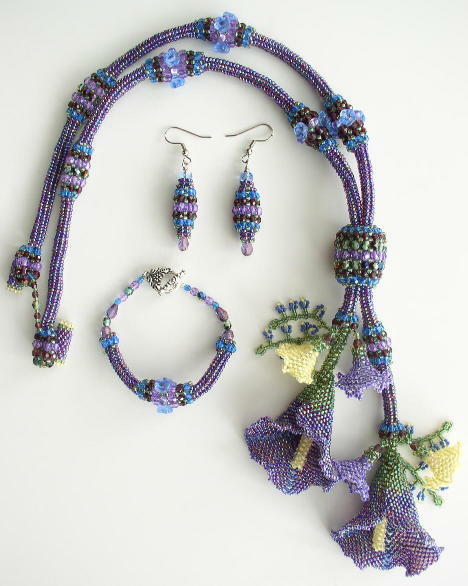 This beautiful combination project features the Calla Lily Necklace with matching bracelet and earrings. Necklace length is 24" plus fringe. Calla Lily Combination in Cranberry. This beautiful combination project features the Calla Lily Necklace with matching bracelet and earrings. Necklace length is 24" plus fringe. 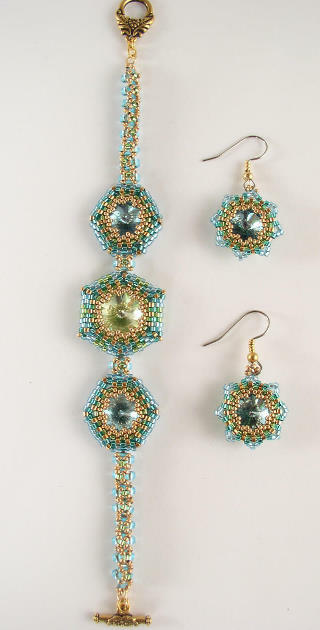 Rivoli Bracelet and Earrings project. 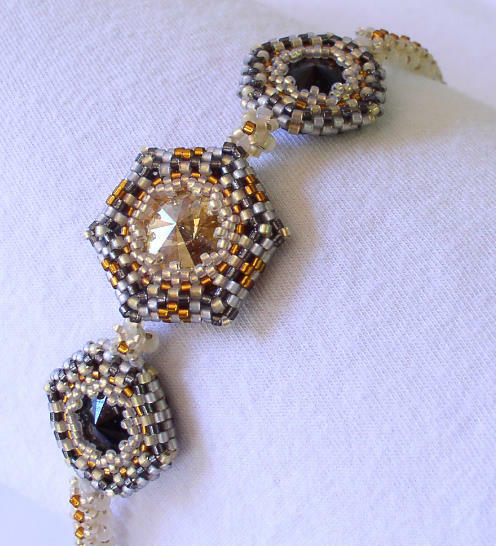 These Rivoli Bracelets are designed in colors to match our Reversible Pendants. The instructions contain supply lists for the four color combinations shown. 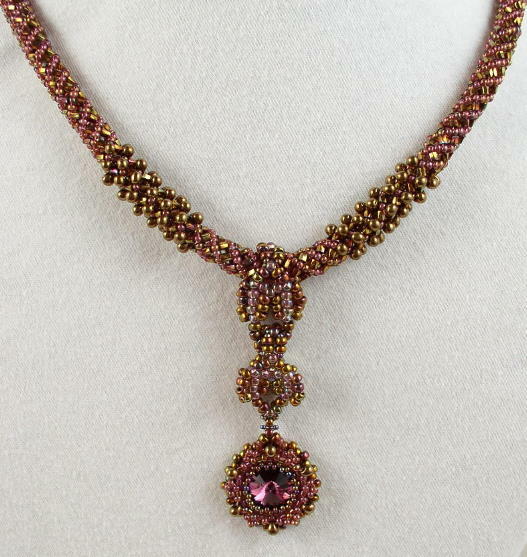 Features Swarovski rivolis and seed beads including 24Kt gold. 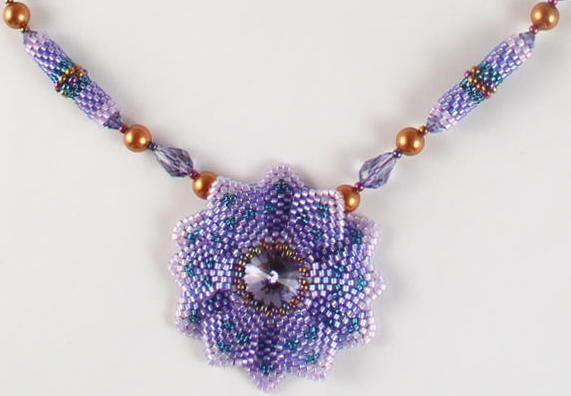 This is an intermediate beading project, using tubular peyote, circular peyote, and right angle weave. May be made up to 10 inches in length. Lotus Flower Necklace. 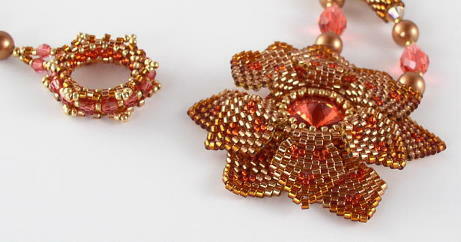 This design features a large lotus flower with a Swarovski rivoli center. The instructions contain supply lists for the three color combinations shown. 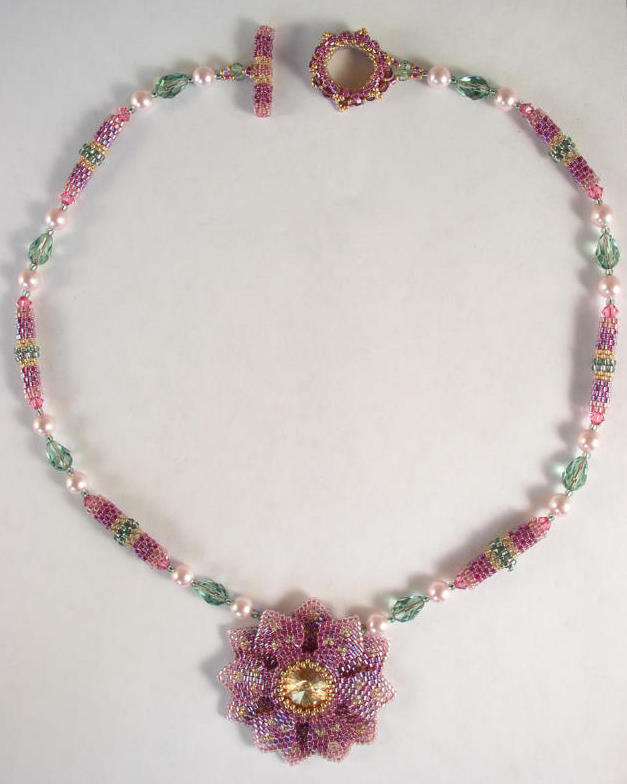 The design incorporates seed beads and Delicas with precious metals, such as 24kt gold. Up to 17 1/2" in length. 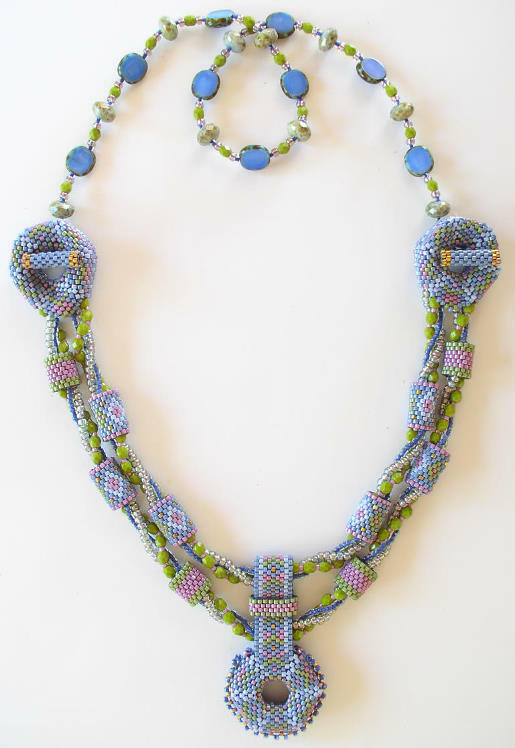 This is an intermediate to advanced beadweaving project, using circular, tubular, and flat peyote stitches with increases and decreases. 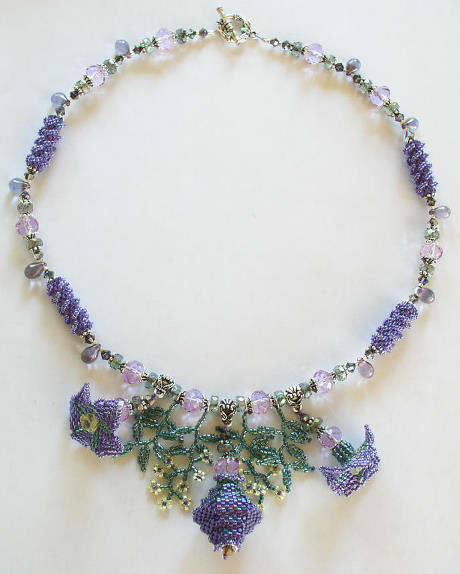 Balloon Flower Necklace shown in Violet and Teal. The sample shown is 19 1/2 inches in length. 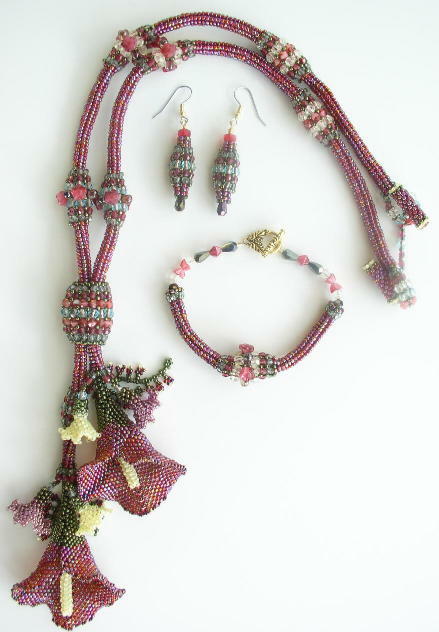 Uses peyote, herringbone, and other stitches. This project is for advanced beadweavers. Crystal Cascade Necklace shown in Aqua and Celery. Features gorgeous Swarovski squares and flowers. The sample shown is about 20 1/2 inches in length. 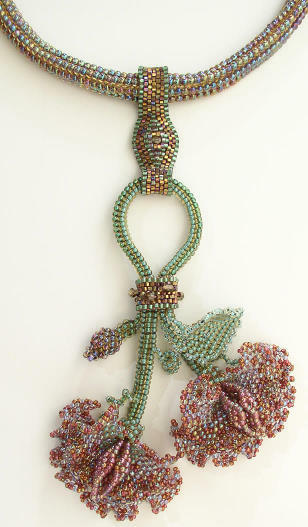 This is an intermediate to advanced beadwork kit using Ndebele, peyote, and brick stitches. 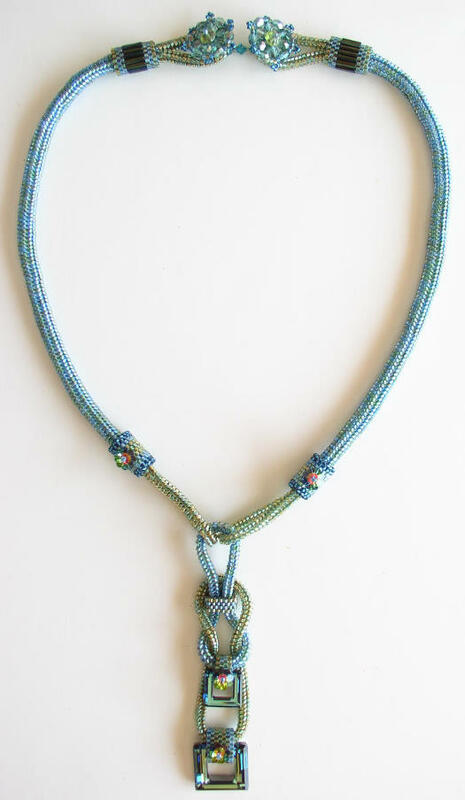 Aurora Necklace shown in Slate Blue, Olive, and Rose. The Aurora's three-dimensional peyote elements and three strands of twisted beads combine to make a modern statement with an Art Deco flair. The sample shown is 25 inches in length. 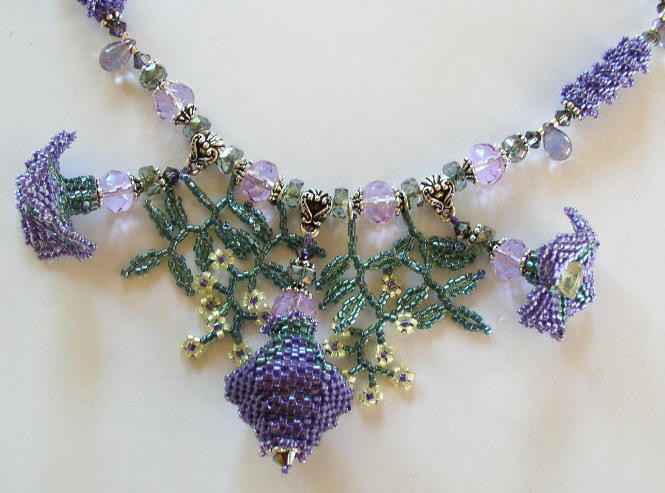 Sweet Pea Necklace Project. The instructions contain supply lists for all three color combinations shown below. 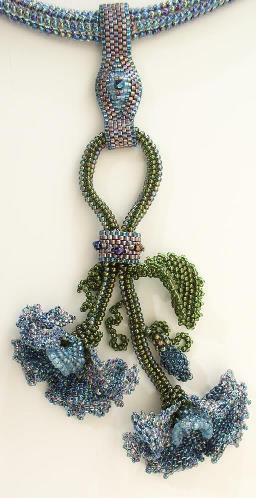 This is an advanced beadweaving project, using herringbone stitch and variations on the peyote stitch. 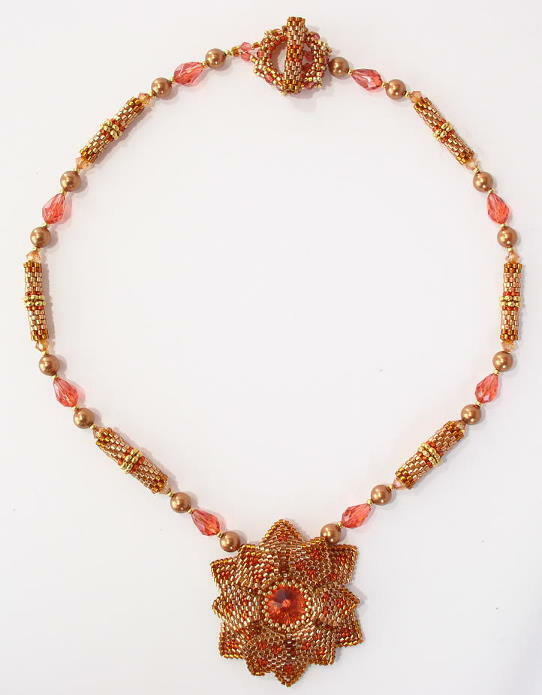 The necklace may be made up to 25" in length, not counting the centerpiece flowers. No tools are required. Natica Necklace Project in two color combinations. The instructions contain supply lists for the two color combinations shown below. 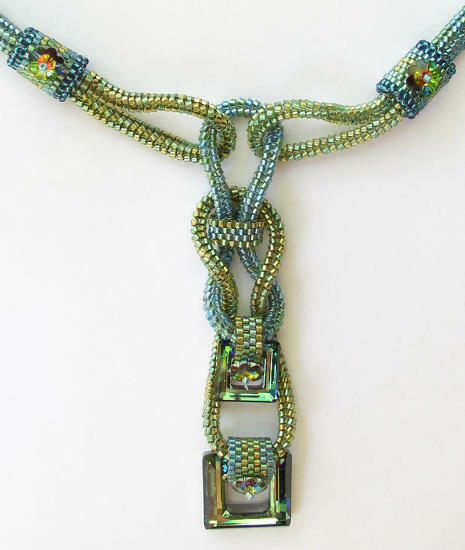 This design features a Swarovski rivoli supended on a unique bail with a matching toggle clasp. 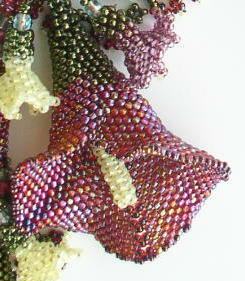 Seed beads and Delicas include precious metals. 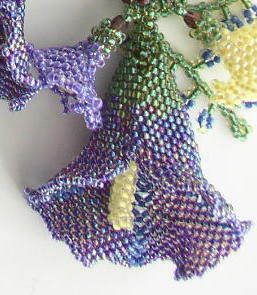 This is an intermediate to advanced beadweaving project, using peyote and basic weaving stitches. Up to 21 1/2" in length. No tools required. Circle Medley Necklace Project in Two Color Combinations. 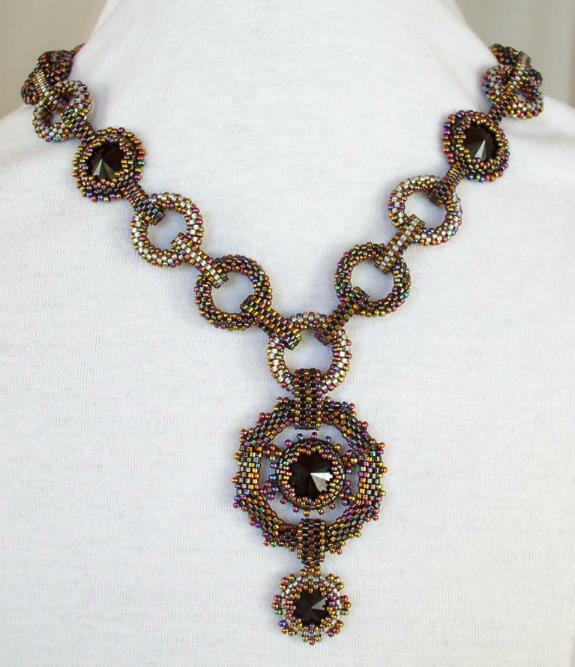 Since chain jewelry has become very popular, I thought it would be fun to play with the idea of a beaded chain. 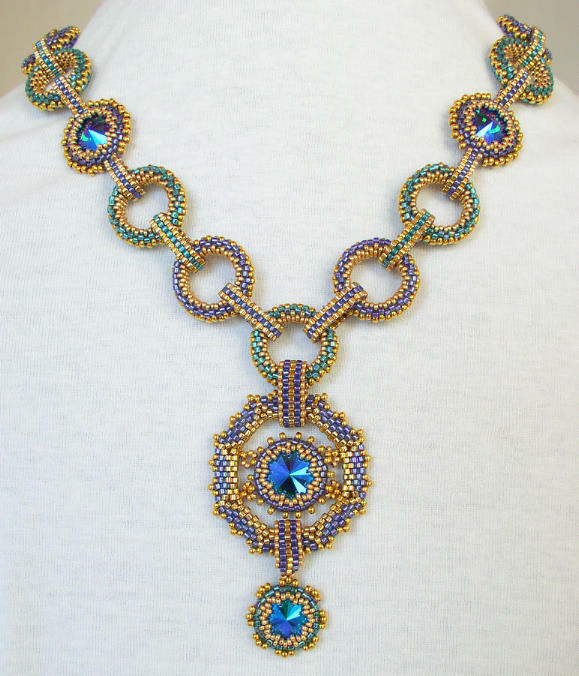 I embellished the basic chain with jeweled links and a pendant that continued the circular theme. The instructions contain supply lists for the two color combinations shown below. 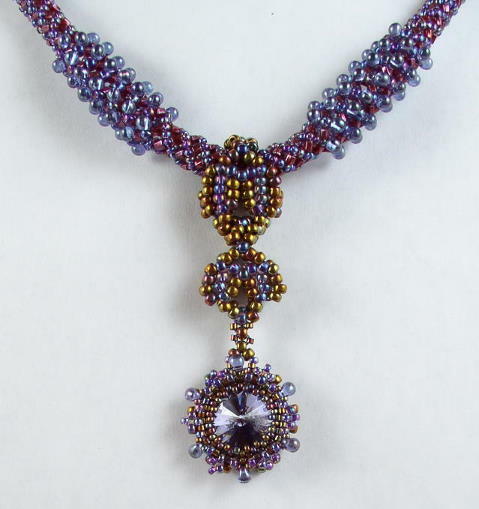 This necklace features Swarovski rivolis and seed beads with precious metals. 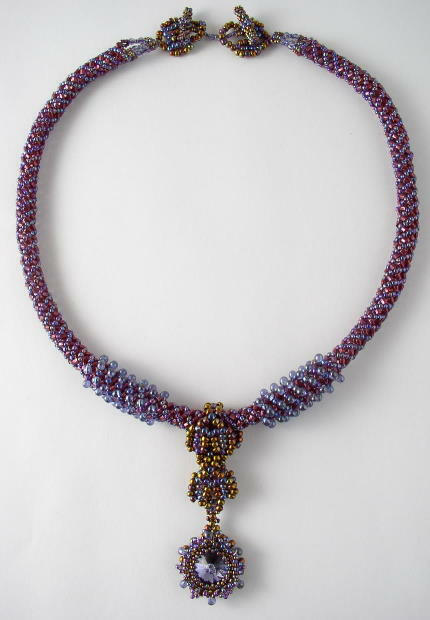 This is an advanced beadweaving project, using flat peyote, circular peyote, tubular peyote, and brick stitch. Up to 19 1/2" in length. Black, Gray, Purple Iris and Gold Iris.